Last Valentine’s Day I made some Swirled Colored Heart Cookies. I loved how they turned out and they really are pretty simple. 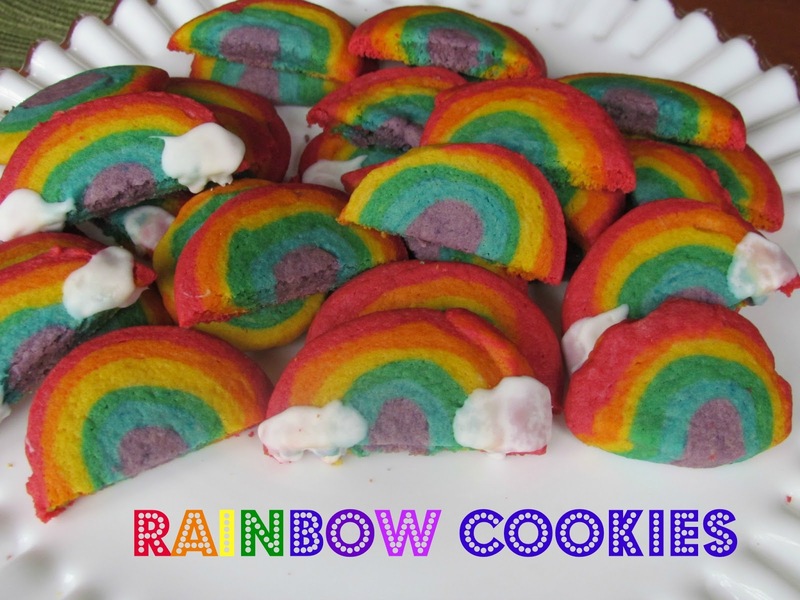 For St. Patrick’s Day this year I thought I would work on the theme of Rainbows and the pot of gold with these rainbow cookies.. Perhaps you want a treat after going to the movie, Oz the Great and Powerful! Find your favorite ice box cookie recipe–preferably with out brown sugar, I learned the hard way, and you are on your way. You could also use pre- made sugar cookie dough, I just don’t like the flavor of that personally. 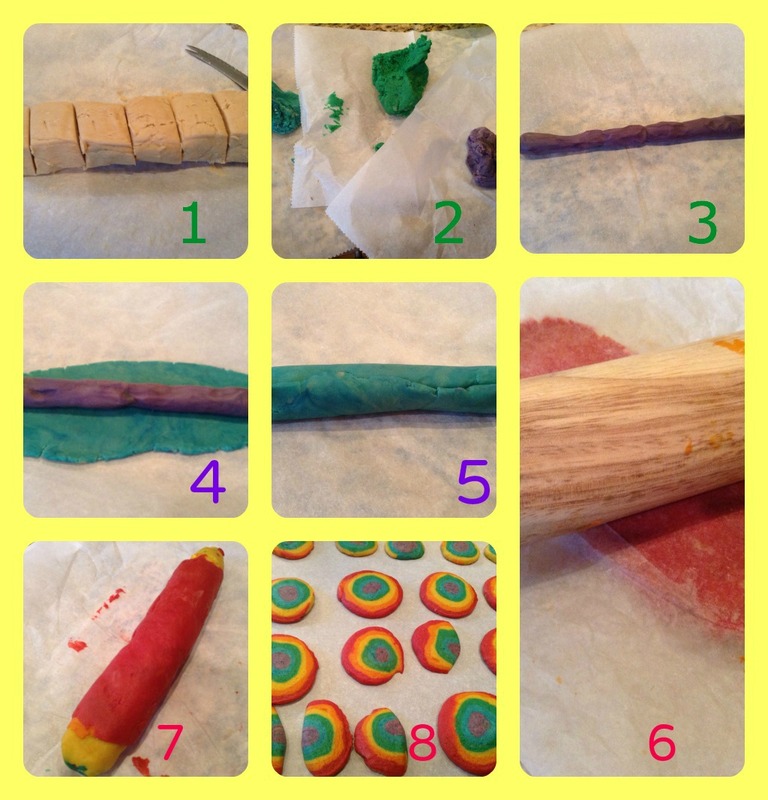 The process is a little time consuming but these rainbow cookies will make anyone smile and are perfect for St. Patrick Day parties, rainbow party dessert or just to brighten up a rainy day. I made these in one morning but just be sure you have some time to allow the dough to stiffen up a few times during the process. Cut the dough log into 6 (if using 6 colors) pieces going in ascending order. Cut off 1/2 inch or so at each end to make perfect swirl log. Cool and add clouds if you desire. Hopefully you will find some gold at the end of your rainbows too!! Be sure to pin this to remember to share the rainbow this St. Patrick’s Day. 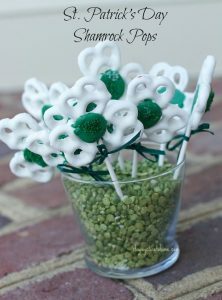 For more St. Patrick’s Day crafts and recipes come visit our St. Patrick Day hop. 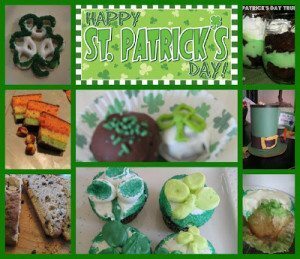 Be sure and share any of your St. Patrick’s Day ideas there too. What Leprechaun Tricks work the best at your house? Maybe a trap with Rainbow cookies?? These look so fun! Pinned them. Thanks. Awww these cookies look so fun, what a great recipe!!! 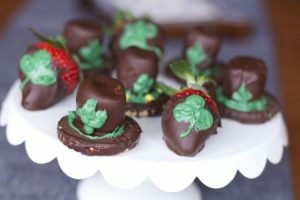 I’m hosting a recipe link up party on my blog and would be thrilled if you decided to participate!!! Beautiful cookies! My grandson would think these are the greatest! This couldn’t have come at a more perfect time! I am in charge of snack at my daughter’s school next Tuesday and they have been gearing up for a Leprechaun hunt! These will be just wonderful!! My daughter just bought some cookie dough (as a fundraiser). This is a great idea. Oh my goodness! These are sooo cute! Copying the recipe now! Thanks! LOVE! LOVE! LOVE! I am going to suggest to my youngest sons daycare owner to do these with the kids for their Easter party! Wow! These are too cute! Perfect for school parties! May I place my order now please 😉 Love them.